Tubers can be made a variety of snacks. Can also be cooked in various ways. 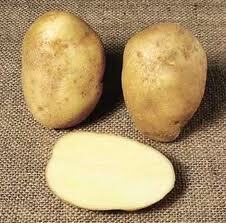 But more than that, it turns out the potato can make the skin smooth and palms, and even eliminate acne and boils. Types of vegetables are still a family with roots of this form is simple. Some are round, some oval, and many other irregular shapes. Although the shape of-way and not very interesting, delicious potatoes in store. Evidenced by the many types of processed potato foods, whether it's snacks and meals such as stews and others. In fact, in some regions and countries, the potatoes used as staple food. Because, besides the minerals calcium and phosphorus, potatoes also contain carbohydrates. According to Prof. Dr. H. Arjatmo Tjokronegoro, MPH, at the energy contained 100 grams of potato 83.00 calories, 2.00 grams of protein, fat 0.10 g, carbohydrate 19.10 g, 11.00 mg calcium, phosphorus 56.00 grams , 0.30 g fiber, iron 0.70 mg, 0.09 mg vitamin B1, vitamin B2 0.03 mg, 16.00 mg of vitamin C, niacin 1.40 mg, and others. Meanwhile, the mineral content of sodium with a high alkaline content in potatoes may increase the pH is too acidic on the body. The content of this helps maintain heart health and enhance tissue elasticity and bending muscles of the body. Another benefit of the potato is to neutralize the uric acid in the blood, treating kidney and heart disease, and reduce mucus in the throat and nose. Moreover, according to Dr. Nicholas Perricone, an assistant clinical professor of dermatology at Yale University Medical Center, United States, in the potatoes contained supplement called alpha-lipoic acid, which can increase growth. These supplements are used every organism. There are no food sources that have a lot of the content of these nutrients in addition to potatoes. In his research, Dr. Nicholas found that tropical fluid alpha-lipoic acid is made to reduce fine lines, wrinkles, and other changes associated with aging in the skin. "Initially we saw a reduction of inflammation (inflammatory) so swollen in the eyes of decline," says Perricone. Within weeks, black circles under the eyes begin to flatten. In other studies with alpha-lipoic acid liquid is more concentrated, the subjects under study reported that less conspicuous scars after the use for eight weeks. Various other studies have found that alpha-lipoic acid are also efficacious for the heart. Lester Packer of the University of California, Berkeley, USA, obtain evidence, the animals that received the supplement in their diet appear more quickly recover from a heart attack compared to those without. A study conducted in Germany in 1997 also found that 800 mg of alpha-lipoic acid per day significantly improve cardiac function among diabetics. Potatoes are very useful. However, like other foods, if most, will result in not good. Likewise with the potatoes. When consumed in excess, the potatoes will cause effects such as nausea, vomiting, and diarrhea. This occurs because there is a substance called solanine. There are several things to consider to prevent it, ie, eat potatoes in moderation. Also, do not eat potatoes that are still young and green due to high solaninnya content. If you want to lower the reaction solanine, it can be done in a way put in cold or damp. Thin-skinned vegetables and cultured by planting tubers directly in the soil has a name that is very diverse in every area. For example, a bushel of potatoes referred to in Aceh, gowi balandra (Nias), yam kumeli (Sunda), wowol (Minahasa), farkia woranda (Papua), and much more. Directions: Clean the bulb with water and peel potatoes. After that scar. After the fine grater, rub the palms of the hands repeatedly. Let the grater is inherent in the palm of the hand approximately 20-30 minutes. After that, take a lemon. Belahlah in half and rub it on your palms until it is clean. Directions: Clean the tubers of potatoes, peeled and cut into small. Insert a piece of potato in a juicer. Give a little water to help the process pelumatan. Drink the juice of potatoes at once. Do it for several days. One glass a day until the spots disappear. Directions: Clean and peel potatoes. After that, thinly sliced ​​about 3 millimeters. Before use, you must first thoroughly wash your face. Paste the potato slices on the acne. Let the potatoes sticking to the gray and dry. Do it every day at bedtime. Directions: Once cleaned and peeled potatoes, shredded and then crushed until soft. Before it is applied to the skin of the face, first wash your face with water. Then, apply the entire grated on the skin of the face until evenly distributed. Let the grated embedded in the skin until approximately one hour. Afterwards, wash with water. Directions: After being cleaned and peeled, shredded and crushed potatoes until smooth. Paste the grated potatoes on the boil and let it stick to dry. If not deflate, pasted again with grated potatoes. - A clean thin cloth about the size of a handkerchief. Directions: After the potatoes are cleaned and peeled, then shredded and crushed. Wrap the grated potatoes in a cloth. Emphasize the packet on the part of the eye to swell a bit stronger so that water soaks the potatoes out of the swollen skin. Perform these actions repeatedly.